Brewed with continental malts and a large portion of raw wheat to sustain the Brett Brux culture that lives in the foeder, this beer was then fermented and subsequently aged for 10 months. At the end of its dormancy we sent the contents of the foeder into a the stainless tank that held the spent raspberries from our Pink Yoshi Berliner Weisse. We then dry hopped it heavily with Nelson Sauvin. 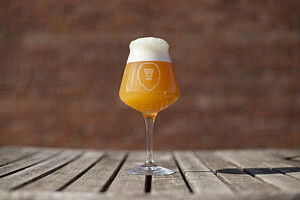 Hints of raspberry, loads of pineapple, and a touch of white grapes; this beer is funky, but the brett brux is beautifully balanced into the overall flavor of this juicy treat.